Think a Doona is something soft, feather-filled and fluffy that you snuggle up with in bed? Think again, people. There’s a new Doona in town, and this one’s a smart child car seat that does double life as a stroller. The Doona, just about to launch on the European market, is a way-clever car seat for babies from new company Simple Parenting that can be used as a stroller too. The wheels tuck in under the seat when in car mode and the entire unit then clips securely into a base that remains anchored in the car. Then simply remove the seat from the car when you reach your destination, a fold here and an unfold there, and you’re good to go. A boon for parents with small cars, it means no more having to clog up the boot with a separate pram. Imagine the possibilities for road trips or shopping trips. Bases are available separately too, so families with two cars can safely share the Doona. Like most innovative nursery and baby products, the Doona is the invention of a parent who had a brilliant idea while going about life with their own baby. Israeli designer Yoav Mazar created it after he and his wife tired of having to juggle infant car seats and prams. (Of course he’s a designer. Did you expect anything less, given the Doona’s rather impressive good looks!) 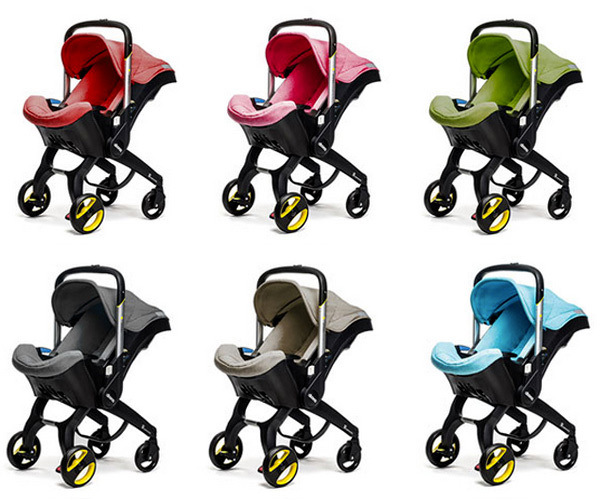 More importantly, it meets all European safety standards for both car seats and strollers. The Doona comes in the six marvellous colours pictured below, as well as black. It will retail for £299 in Europe and is expected to hit the American market soon as well. It is not available in Australia, but we’ll let you know if that changes. Until then, browse our post archives for child car seats and strollers that you can have right now.